By H.E. Marshall. This work, first published in 1913, telling the story of Germany from before the Roman Empire to the time of Emperor Wilhelm II, was acknowledged an instant classic upon its appearance, but the tragic outbreak of the First World War the following year saw the book suppressed. This work ranks with master-storyteller Marshall’s greatest works, providing an immensely readable but comprehensive history of Germany. 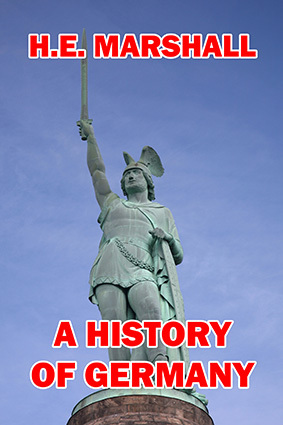 Read about the mythological origins of the German people, their first great heroes Ariovistus and Hermann, their titanic struggles against the Huns (where they first earned the title of European, meaning People’s Defender), their forced conversion to Christianity under Charlemagne, the division of the Carolingian Empire into France and Germany, the repeated invasions and settling of Post-Roman Empire Italy, the various German states, the Holy Roman Empire, the wars against Napoleon, the struggle for ascendancy between Austria and Prussia, and finally the unification of Germany. A remarkably well-written overview which serves as the perfect introduction to the development of one of continental Europe’s superpowers. Frederick the Noble and William II.